Rupes Recta is a well-known linear rille that extends over 100 kilometers in length. Portion of LROC WAC monochrome mosaic, illumination is from the left, and asterisk notes location of LROC NAC. Several weeks ago LROC featured a series of WAC monochrome mosaics of some of the most spectacular sinuous rilles on the Moon (Rimae Posidonius, Vallis Schörteri, and Rimae Prinz). 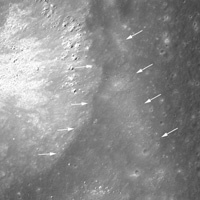 Unlike sinuous rilles, linear rilles (or graben) are not believed to primarily result from lunar volcanism. Linear rilles are surface manifestations of structural faulting that formed when the lunar crust was pulled apart. The widths of these linear rilles range from as little as a few meters to kilometers across; Rupes Recta is between 1-3 kilometers wide across its length. In addition, Rupes Recta is composed of several en echelon segments - the linear rille is not a single, uninterrupted 100 kilometers length fault. There are at least 5 large fault segments visible at the LROC WAC scale (100 meters/pixel) that range from ~8 kilometers to 50 kilometers in length.